"To put back more than we take." So WHY DO WE NEED WILDLIFE ACTION? We are moving forward in Wildlife Action on 5 fronts: Preservation; Conservation; Education; Sportsmanship; and Fellowship. I realize you may not understand where we are headed by just listing our law. If you are like me, you have to see it done; you can't visualize it. Thus, I understand your confusion. If we were a single-issued, single-focused organization like so many of our other brothers in conservation, we would have less confusion, but there would be no need for Wildlife Action. That's why, in 1977, Wildlife Action was formed. There is no better conservation group in the world for preservation than the Nature Conservancy. But the seven guys that started Wildlife Action wanted more than just that. Likewise, as far as conservation is concerned, the National Wildlife Federation is the world leader. There again, we didn't want just to conserve. As for education, the National Rifle Association and the timber industries have some of the best educational programs in America. Sportsmanship? All of them believe, but the Izaak Walton League is known for its outdoor ethics. Fellowship is when two people sit on a mountainside watching a sunset or a father and son on their first squirrel hunt. So why do we need Wildlife Action? I was a member of all of the above conservation groups. However, one of the original ideas in 1977 was to consolidate our efforts, streamline the red tape, and rid ourselves of bureaucracy and high administrative costs. When leaders of conservation groups make $200,000 plus and others raise over $1,000,000 a day and we are still losing our precious resources, you as a frustrated member of society, definitely have a right to know where your dollar and organization are going. Our organization seems unorthodox in the way it handles issues. There are policies of Wildlife Action, like the Bill of Rights of the U.S. Constitution that we can never change; policies that you agree to follow when you become a member of a chapter. I have had people say, "That's not right." Well, WLA disagrees; you don't have to join. That's your choice. We don't want one element, let's just say anti-hunters, to gang up and join Wildlife Action and then vote that we can't hunt. I love feeling secure that my conservation organization is not going to flip-flop every time a new administration comes in. That, in itself, is a step forward and that's where we're going -- forward. I no longer wanted to have to join 5 different conservation groups so I chose, along with 13,999 other members, to put my $20 in one organization, Wildlife Action, with 5 divisions of efforts. We hope that one of these divisions is where your interest lies. All you have to do is jump in. That's simple enough. Might as well tell you though, these divisions don't always agree, which brings me to our logo. 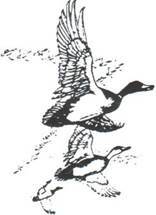 Many organizations have ducks, quail, deer, or dolphins on their patch to represent their single-minded issue. On our patch, we have a hunter and a fisherman, two of the strongest environmentalists I know, representing what we stand for ­people and their rights as private individuals. We choose to work on more than one single avenue because we believe the world is more complex than one single issue. Granted, single-focused organizations are simpler and easier to understand; however, we choose to focus our efforts in 5 categories that we believe are required to keep our ecological system on this good earth intact. We don't raise money to save a particular sport or species; we raise money to save habitat and the good earth. If we save the habitat, the resource will take care of itself. The largest threat to wildlife is the loss of habitat. We choose the goal of our efforts to be "to put back more than we take". We strive with volunteer people to accomplish that goal so that "local folks can solve local problems;" therefore, the name Wildlife Action, not "Wildlife Sit On Your Behind". To make sure we accomplish this goal, we choose to educate our greatest resource, our children. Thus, our well will never run dry. In this increasingly complex society, old ways are no longer guaranteed to work; here again the need for Wildlife Action and its new approach. Our national board of directors is made up of men and women from various walks of life, each with a close-to-heart issue that s/he feels is more important than any other. They have the maturity to seek what is best for our children and grandchildren. We are an organization of research and facts bringing a consensus of one. Orientation courses are conducted before these volunteers begin working in their positions because there are those in WLA who love to talk and philosophize on how we should save a river or protect hunting and fishing rights. But we need more than just "ideas" and talk. It is one thing to "love" and have emotional feelings for a principle, but you must have wisdom and perseverance to follow through. Love gives great intentions, but ACTIONS get the job done. One thing that makes Wildlife Action such a challenge is that in dealing with people, we place an emphasis on education; education is "to learn". To learn is to ultimately change behavior. Other organizations strive to change laws; we strive to change social behavior. That is why so many of WLA's activities focus on our young people. Even though we are not the best known conservation organization due to our choosing, we work constantly towards our goals, never losing our values, spending all of your money on conservation-related activities. Not one dime of your membership money goes to your magazine, Wildlife Pride grand advertising schemes, or inflated salaries. Sponsors handle all of these financial obligations. Those are hard values in this day and time when many conservation groups are more interested in "growth" rather than successful projects. Values are the emotional rules by which a Nation or organization governs itself. Values summarize the accumulated folk wisdom by which society organizes and disciplines itself. And values are the precious reminders that individuals obey so as to bring order and meaning into their personal lives. As your President, I am often reminded my values are old and out of date by other's standards. Some of our members whose values are somewhat different have even gone to battle with our constitution, by-laws and me. In this organization, that is welcomed! After all, we have become a society of suspicion, apathy and skepticism. But not you; you've joined - you believe! It would be wonderful if every child had the warm comforting experience I had in my Sunday school with songs, its stories, its bags of candy at holidays. But many are denied that. And while religion is an admirable teacher for those connected to it, it is a silent voice for those who are not. So be it. Where I learned my values are no more important than where you learned yours - possibly from the same resource - Mom and Dad. The bottom line is that good values must endure and be taught as the foundation for our lasting days. "Local folks solving local problems" is our motto; thus, pointing to individuals as the main ingredient in solving any problem. However, there is a danger to this which relates back to the old saying "a chain is no stronger than its weakest link "-strong values, strong chain. For many, individualism has come to mean that "anything goes" as long as it's in their interest - as opposed to recognizing that one is part of a larger society As long as our attitude continues to be, "don't tax me, tax the guy behind the tree", we are not recognizing that we are a part of a larger society. Conservation groups also fall into this trap of individualism by losing sight of the local individual. In Wildlife Action, we like to say "think globally, act locally". Saying this constantly reminds us that we are, in fact, a part of a larger society; thus, the society's well-being should be of great concern to us. It then should follow that if we believe this, we must have a deep concern for "seeing more emphasis on traditional values". Politicians won't solve our problems for us. We must roll up our sleeves to tackle the new and difficult story of America. If we truly want to make this a better country and world, the first thing we must learn or in some cases, relearn (depending a great deal on our age), is that nothing of lasting value or importance in our way of life, none of our proudest attainments, have ever come without effort. America is an effort. We are a Nation of risk and adversity-of fearful seas to cross just to get here in the first place; of land to clear; rivers to ford; floods; epidemic diseases; of slave chains and city slums; drugs; and the loss of Mom and Dad values. So what is Wildlife Action’s new idea to old values? It's simple. If we want it to happen, it's going to take effort. We should stand tall, spit on our hands and take a fresh new "holt". Join in the "action" of Wildlife Action. Get a friend to join with you! If this is not your spirit, for those of us who believe it is our spirit, we are willing to go alone. Wildlife Action does not play a numbers game. If the politicians of our time fail to meet the challenges of our time, we have only ourselves to blame. If we don't vote, if we are unwilling to pay our fair share, or even to take part in the census, then what good are we as citizens? What will history say of us? This country, with its institutions, belongs to the people who inhabit it. We must strive to "put back more than we take". How can we do this? Like the wise man that saves some each week, we must learn to preserve certain ideas and properties. To move forward, we need to respect our differences, to "use, not abuse" for consumption. We're seeing a fragmentation of .our society, a polarization; 15% to 20% of our people are being marginalized. They are incapable of participating either economically or politically. Since "we are what we do ­ACTION", the test will be in what we value, what we want, and ultimately, what we achieve - what we are willing to accept. .
Our society has been unwilling to strengthen our educational system - education being a key word for the opportunity to achieve Wildlife Action's goals. Thus, WLA has education as a high priority. We start with the young, and, making a truly deep commitment to our children-the Pioneers-we have implemented day camp, ICT's (Instructional Camping, Trips), Program S.H.A.R.E. (Student's Habitat and Resource Education), and Adopt-A-Library Programs, and built several Resource Education Centers. .
We must learn to open our hearts, our minds, and our facilities and share our knowledge and our time with our children or even someone else's child who may not have the experience of enjoying nature. Share your boat, your fishing-hole, or anything you as a WLA member might have that could teach someone else the right way to hunt, fish, or simply preserve and enjoy nature. In the above paragraphs, I have mentioned what WLA is doing to educate the children. This whole letter addresses what we must do to educate ourselves as adults. If you can do what the above paragraph says, you would make a good Wildlife Action member. If you are one to ask, "What's in it for me?” save your stamp. To save our society, we must save ourselves through a change of values. Freedom of expression is wonderful, but when a society chooses not to produce or protect for future generations through its freedom of expression, there is a need for leadership to motivate a change in non-producing values. Here again is another reason for Wildlife Action. Wildlife Action is change. We are a hard organization because we expect work. We expect responsibilities to be carried out. We are not a brainstorming, blue ribbon committee of ideas and coffee drinkers writing huge pages of what should be done. We work with dirty hands and clean hearts, not clean hands and dirty hearts. This brings me to another point. Wildlife Action is guilty as sin. There is no greater than thou because we have chapters in Wildlife Action that are in it just for themselves-single-minded goals of only canoeing, shooting, or whatever fits their self-indulgent needs. I realize people enjoy doing what they enjoy doing and we want those people in Wildlife Action. No one is trying to say that you must get out. "Ahhh, Bunny, you are speaking out of both sides of your mouth," you may say. You're right. It's like when I ask someone to join and he says, "I'll give you $20, but I'm not going to do anything even though I think you all are doing great." I am telling you now, take his $20 because some of those members that we signed up in 1985 and 1987 that told me that, are now board members and officers in our organization. Due to their leadership and steadfast guidance, WLA owes no money on all purchased land. We are in good financial shape even though we are small. We are slowly but surely building a foundation that you would be proud in which to place your trust. So, where is Wildlife Action going? My answer is simple. It's up to you as an individual to find your niche on how to make this a better world if you believe that it needs to be done. And I believe you believe this. That's why you joined Wildlife Action. Wildlife Action is the vehicle for you to travel on to reach your goal. It could be from backyard conservation and feeding the birds to the grandest scale of saving the ozone layer. You can be as big or as grand as you want to be. You can be in charge of any committee at any time or you can even form your own committees. All you have to do is get some people that believe as you do to help you. That's how Wildlife Action was formed.